NF-1 is a condition characterized by changes in skin pigmentation and the growth of tumors along nerves in the skin, brain and other parts of the body, according to the National Institutes of Health. This can put pressure on the nerves, which may causes pain and loss of function in the affected areas, according to the Neurofibromatosis Network. It affects approximately one in 3,000 to 4,000 people worldwide, and while scientists have not yet figured out a way to prevent neurofibromas, surgery is generally recommended to remove them, according to the National Institute of Neurological Disorders and Stroke (NINDS). If Ethan’s tumors become malignant, treatment options include surgery, radiation and chemotherapy, but until cancer or nerve functionality is detected, there are mixed opinions on whether patients should proceed with surgery. “There is no general agreement among doctors about when surgery should be performed or which surgical option is best,” according to NINDS. 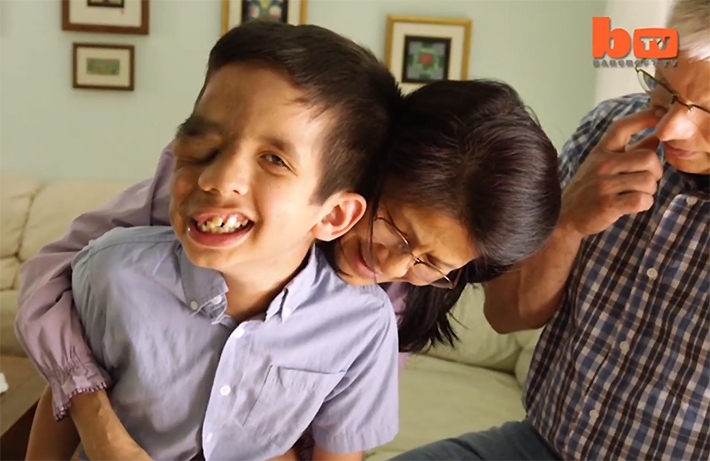 Ethan and his family figured out a way to help the public understand more about the condition — and how to approach people with it. They created a brochure to pass out to curious strangers.